Looks like some friends decided to have some fun with a chubby wolf. 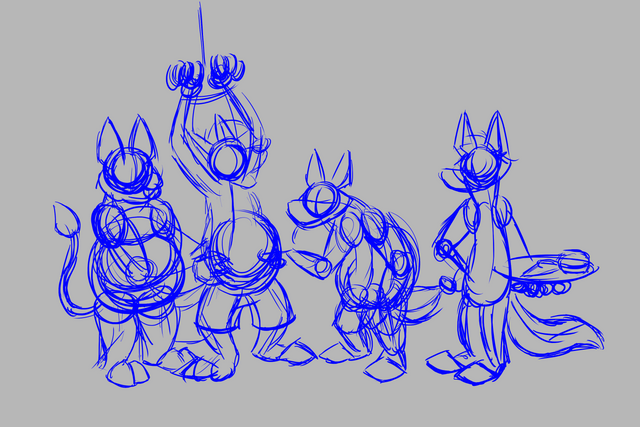 I start off with a neutral color canvas and rough sketch in the characters and poses for them. Then in the fine sketch layer, I sketch in a more detailed sketchwork over the roughs. Then after client approval, I go ahead and lineart over the sketches. With the contiguous "wizard" tool, select all areas outside the parameters of the characters then invert the selection and fill in the area with a neutral color. Do this method this way instead of just selecting areas inside the lines to make it easier plus to avoid little gaps in your base color. Then in the respective characters' folders, add in their primary colors. Then mask the color folders down to the base color layer. 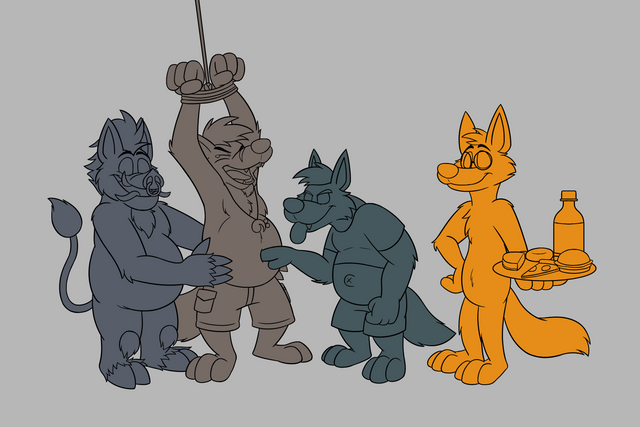 After the primary colors, I add in the other color details for each character. Then turn back on all the color layers. I whiten the canvas background. Then finally, I add in a yellow background using a random pattern brush. And then the drawing is done! And thank you! Yeah, this one was a pretty fun one so I'm glad it's fun to y'all as well. Great funny painting: i really like to take a look to the step-by-step drawing, because they help to understand how the artist works. Thank you Moncia! I'm glad the step-by-steps are helping folks. What a gorgeous and amusing drawing! I love your creativity! Great work, thanks! 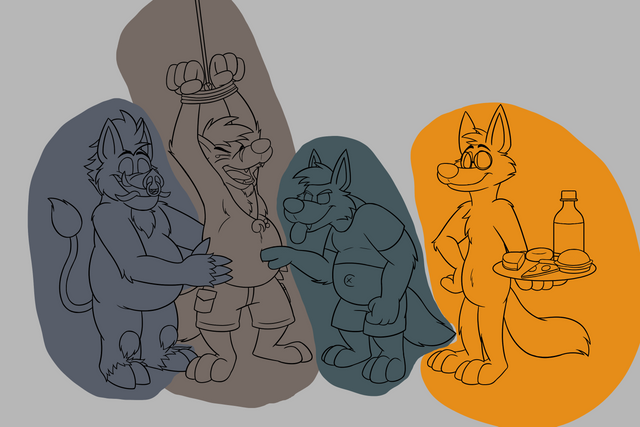 This is quite a complicated commission especially with four characters interacting with each other. I think you did a great job expressing each of their personalities well, the one in the middle looks totally mischievous and enjoying himself a lot XD. Your UA account score is currently 1.596 which ranks you at #35198 across all Steem accounts. In our last Algorithmic Curation Round, consisting of 187 contributions, your post is ranked at #42. Hello @bleuxwolf, thank you for sharing this creative work! We just stopped by to say that you've been upvoted by the @creativecrypto magazine. The Creative Crypto is all about art on the blockchain and learning from creatives like you. Looking forward to crossing paths again soon. Steem on!